The G9 bulb is used in a variety of applications such desk lamps, make up mirrors, under cabinet lighting and many others where lighting is required in a small space. Unlike the traditonal bayonet or screw type fiitings the G9 fitting is characterised by two looped metal prongs. We stock a range of retrofit G9 LED equivalents which will simply fit into your existing G9 fittings. 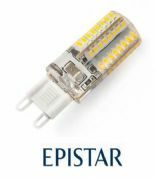 We stock LED G9 bulbs that are equivalent to 10-15W, 20W, 25-30W and 35W from a range of manufacterers including Integral led, Epistar and Samsung.